For this sentence alone, I will always read everything Evans publishes. 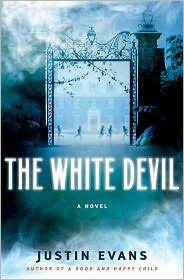 Evans has a pretty ambitious premise for his second novel, The White Devil. A young American kid who has seemingly fallen backward into some bad behavior lands in an English prep school as a last ditch effort. If he can’t stay sober, stay straight at Harrow — a school that once helped shape the young mind of Lord Byron — his dad is done with him. Unfortunately, there is something about Andrew Taylor: He looks like Byron. The resemblance stops Persephone, the only girl at the all-boy school, a theater sort who knows that they need a student to play Byron in an upcoming production. He also catches the eye of the resident writer charged with creating the play, Piers Fawkes, a scatterbrained creative who is trying to shake the drink. And, unfortunately, he catches the eye of the Harrow ghost, an anemic-looking soul who seduces Andrew and attacks those he is close to. Andrew has barely unpacked when the fellow student who showed him around winds up dead in the woods, and the autopsy reveals that he was killed by a pre-existing disease. Although, Andrew is the one who finds his friend dead, and he sees an image of the Harrow ghost atop his new friend, somehow hastening the death. And then there are more victims. Evans novel takes the super scandalous life of Lord Byron and turns it into a supernatural mystery. Mostly: How can Andrew shake this ghost? What is his secret? What does he want? A sort of Scooby Gang of people willing to believe in otherworldly murderers gathers to get to the bottom of it: A librarian, the aforementioned mess of a writer, the sassafrass girlfriend, Andrew and a sidekick. And they have to do all of this without attracting the ire of school officials, who are watching them all very closely. Evans’ first novel also includes a demonic presence in a way that feels like literary intrigue. This one seems to lean more toward a creative approach to genre fiction. In this respect, the set up works. The first half is a page turner, which makes the flat characters tolerable. The second half is groan-y and the seams really show. Queue up the romantic montage starring the young lovers running through the streets! While the reveals are very duh-duh-dah, the fix for the situation isn’t very climactic. It serves to plant an “I want to read a book about Lord Byron” seed more than anything else. Oh goodness, I have to read this book!